Our day started at Mirpurkhas with a substantial breakfast that was to launch us on a 500-km drive in the Thar Desert, to be completed by nightfall. The clear morning sky was the foreboding of a piercing April sun but, an outing to places off the beaten track having become one of my favourite diversions of late, there was no holding back. Having had a comfortable night stay in the mini Officers’ Mess (which used to be an airport lounge for use by the late Prime Minister Junejo of nearby Sindhri), we set course for Umarkot via Khipro. The more direct route is a jumble of bone-jarring and tyre-slashing craters, so a longer ride was actually welcome. Egrets and herons preyed on unwary frogs in the roadside ponds, while daring little doves lifted off successfully from the middle of the road at the very last moment. The occasional putter of the ubiquitous Qingqi rickshaw – grotesquely loaded as always – reminded us that humanity too, was around. By 10 o’clock we were at Umarkot, with my friend Nauman eagerly looking for a hot cup of tea. All shops were under orders to ‘voluntarily’ remain closed due to the death of a Sindhi nationalist leader. We were, however, lucky to stumble on to a tea stall whose owner had cleverly decided to make a day’s living by serving the ‘grieving’ public. Umarkot – purists insist it was always Amarkot – houses the district headquarters, though it is more famous for being the birthplace of Emperor Akbar. After tea, we drove into the nearby Umarkot Fort and were instantly horrified by the prevalent state of dilapidation and decay. Built by Mian Noor Muhammad Kalhoro in 1746 AD over the remains of an earlier mud fort of undetermined antiquity, it served no purpose when the Persian ruler Nadir Shah humiliatingly vanquished the Kalhora ruler while he took refuge there. The fort was later sold to the Maharaja of Jodhpur by the penniless last Kalhora ruler, Mian Abdul Nabi, but it was forcibly recovered by the Talpurs in 1813 AD. Though there is nothing remarkable about the fort, the raised central platform, which forms a suitable vantage point overlooking the city, has an impressive battery of seven cannon pointing outwards at possible intruders. 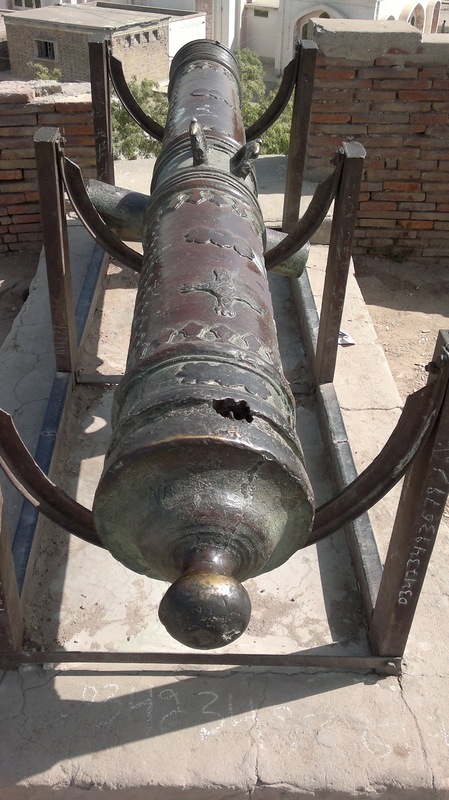 It is likely that the battery is the handiwork of the later Talpurs who had learnt a lesson from the Nadir Shah episode and, had bolstered the fort’s defences. A museum inside the fort is yet another example of extreme apathy and neglect. Priceless publications, including a copy of Abul Fazal’s Ain-i-Akbari, Mughal paintings and motley coins, statuettes, and assorted weaponry lie hopelessly abandoned in an unkempt building. Vagrant beggar women squatting in the dust completed the pathetic scene around the museum. Before leaving the city, we drove to the purported spot where Hamida Bano Begum gave birth to the illustrious Jalal-ud-din Akbar, while her husband Humayun was in flight from Sher Shah’s pursuing forces. A rather ordinary modern day monument in the shape of a small domed pavilion marks the birthplace, which is a short distance from the present-day fort. “The Rana [Virsal Prasad] gave the Emperor an honourable reception and took him into the fort, and assigned him excellent quarters,” notes Humayun’s sister Gulbadan Begum in Humayun-Nama. If the predecessor of the present fort that is being implied in the annals was located where the monument stands today, there is no trace of its ruins or the quarters it held inside. One is tempted to think that the local city administration may have been coaxed into declaring the site as sacrosanct for questionable reasons, or maybe it was just shoddy research about the location. I am reminded of one of our atomic scientists who was immensely moved to honour Sultan Shahab-ud-din Ghauri with a tomb at Dhamyak near Sohawa, over a grave that never was! The sooner we had driven off from Umarkot, the scenery changed to an arid landscape, with shallow sand dunes riveted to the terrain by scrub and bush. Danda thohr (Euphorbia caducifolia), phog (Calligonum polygonoides) and akk (Calotropis gigantea) are the most common plants that could be seen for miles on end. Every once in a while we would come across small Thari settlements which look like African kraals; the accommodation consists of rather spartan huts known as chaunras, which have circular mud walls with a conical thatched roof. Life in these settlements is a never-ending struggle for survival. 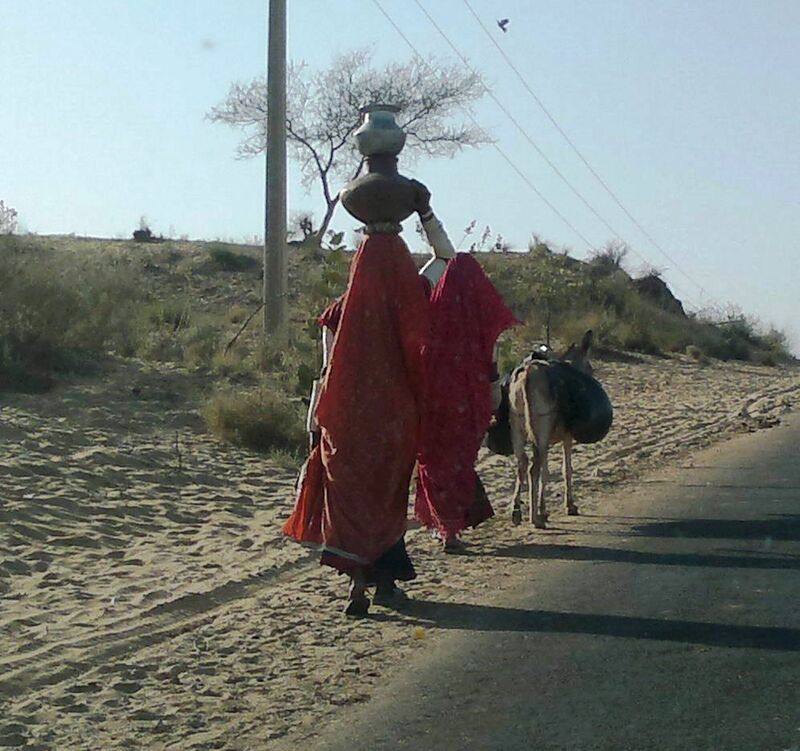 When not braving intense heat and dust, collection of water becomes the most important chore for Tharis. 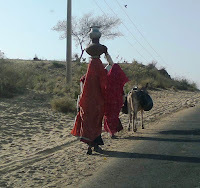 Womenfolk in colourful dresses with their arms fully swathed in white bangles could often be seen with a couple of water pitchers perched jauntily on their heads. Men were seen usually idling about, while their cattle or sheep grazed nearby. We noted that Tharis are quite malnourished, what with millets and lentils being their staple food. Not a single meat shop was to be seen in any of the small town bazaars that we passed by. After reaching Chachro, we turned south to Islamkot and then again east towards Virawah, having to go through ID checks at Rangers posts at every stop. The road is in an acceptable condition and is mainly used by open jeeps converted as passenger vehicles. Ex-Army 3-tonne trucks known as kekras (crabs), suitably embellished with our trademark truck art, carry goods to and fro in Thar. 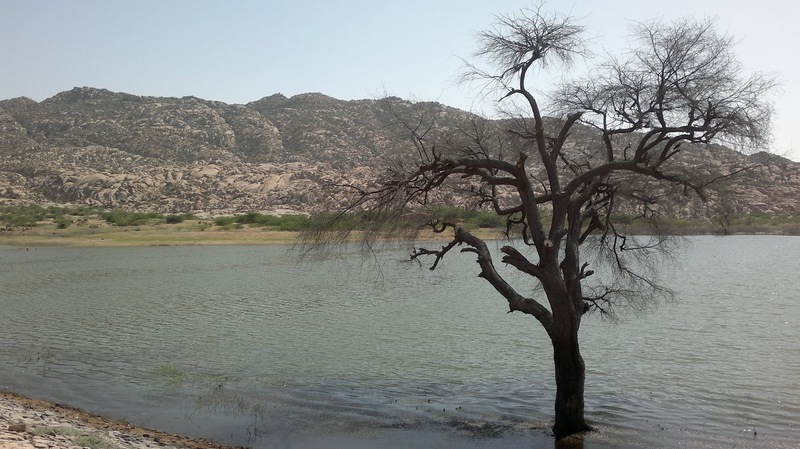 Beyond Islamkot, irrigation channels sourced from rainwater catchments have helped in the growth of some hardy trees including peelu, babol and neem. As we got closer to Virawah, which is located at the northern edge of the Rann of Kutch, the sand dunes started to subside while shallow salt flats could be seen all around. Shortly after mid-day, we saw the ‘welcome’ signboard at Nagar Parkar, with the ruddy Karonjhar Hills forming a fascinating backdrop. Going past yet more Rangers and Police check-posts – the Indian border being a mere 15-km – we drove straight to the bazaar. At the end of a side street is the Jain Mandir, said to be at least five centuries old. A notice by the Department of Archaeology warns against any vandalism or damage, the temple being a ‘protected’ monument. The warning flew in the face of the authorities when we were confronted by a pack of dogs resting right inside the inner sanctum of the temple. We took some pictures from a distance and headed for lunch. Dirty as the bazaar was, we had second thoughts about our planned lunch at a dhaba and considered gate-crashing at the Rangers’ Mess. However, aware of military correctness, we spared ourselves and the potential hosts the hassle and settled for a spartan meal, downtown. We were constantly stared at, for it must have been a while since the locals saw trousered babus eating in their midst! The last stop in Nagar Parkar was at the tiny Bhodesar Mosque on the northern reaches of the town. Struggling to rise above the babol shrubbery, its pink painted dome came into view near the hamlet of Bhodesar. Entering through the gate of the mosque compound, we passed by several very old graves. The mosque is a modest structure made of crudely set sandstone blocks. A stub of what might have been a minaret is visible on the roof. The prayer chamber is walled on three sides, while the front is open, supported by four marble pillars. The bottom segment of each pillar has four sides, the one above has eight, then sixteen and finally, the top-most segment is circular. 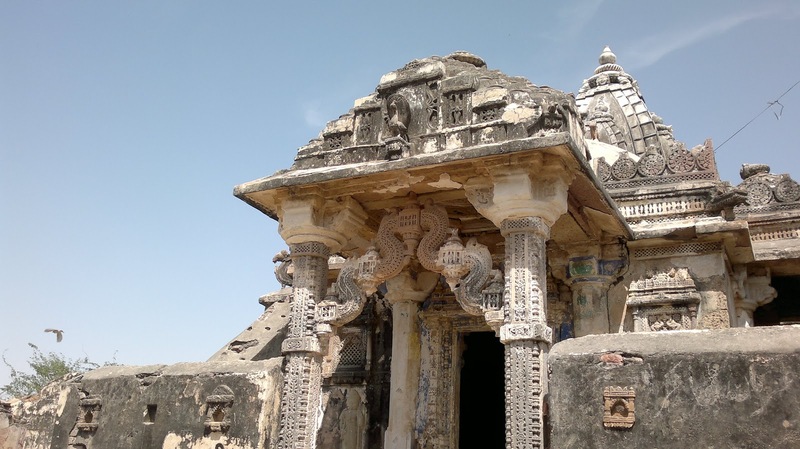 Such pillars are common to the Jain temples in the vicinity, so local craftsmanship had been optimally utilised. A stylised lotus flower embellishes the mihrab, while another lotus finial surmounts the dome; such architectural themes cutting across vastly different faiths is indeed unique. The mosque is attributed to Sultan Mahmud Shah ‘Bagra’ the most eminent ruler of Gujarat. Constructed in 1505 AD, the mosque can be seen as a symbol of his authority which extended as far as Nagar Parkar. 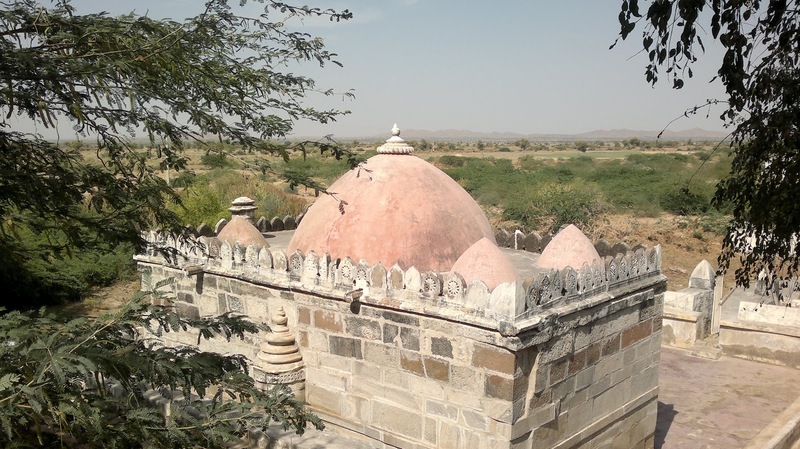 The location of the mosque well removed from the town and, in the vicinity of three Jain temples, indicates the Sultan’s desire to challenge the power of the Jains. The mosque may well have served its purpose, for Islam gradually took hold in the region and continues to thrive, as the fully functional loudspeakers on the rooftop of the 500-year old mosque testify! Just behind the mosque is the beautiful Bhodesar Lake which is actually a rainwater catchment area, with an embankment constructed to serve as a water reservoir for the locals. Set against the Karonjhar Hills, over which the locally occurring Dusky Crag Martins could be seen darting and swooping in delightful flight, a camping night would have been a perfect finale to our trip. However, having to get back during daylight lest we ran into potholes or worse, we drove off to Mirpurkhas via Mithi, Naukot and Digri, quite happy having done the Rann in a day! This article was published in the daily newspaper The News International on 29 April 2012.